What do you call this sweet treat…? * I suggest sieving the Bicarbonate of Soda so that there are no lumps when tipping it into the toffee mixture and that it gets evenly dispersed. 1. Grease a 20cm (8 inch) square baking tin with vegetable oil, then line with baking parchment and lightly oil that too. 2. 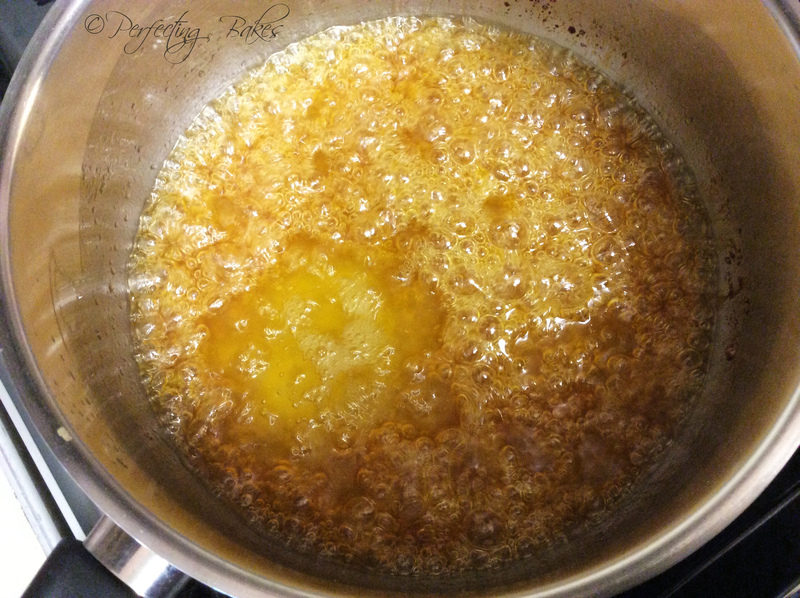 Gently heat the butter, sugar and golden syrup in a large heavy-based saucepan until the sugar has dissolved. Turn up the heat and boil the mixture rapidly, without stirring. If the mixture goes darker at one side of the mix, then gently swirl the pan to mix it all together. 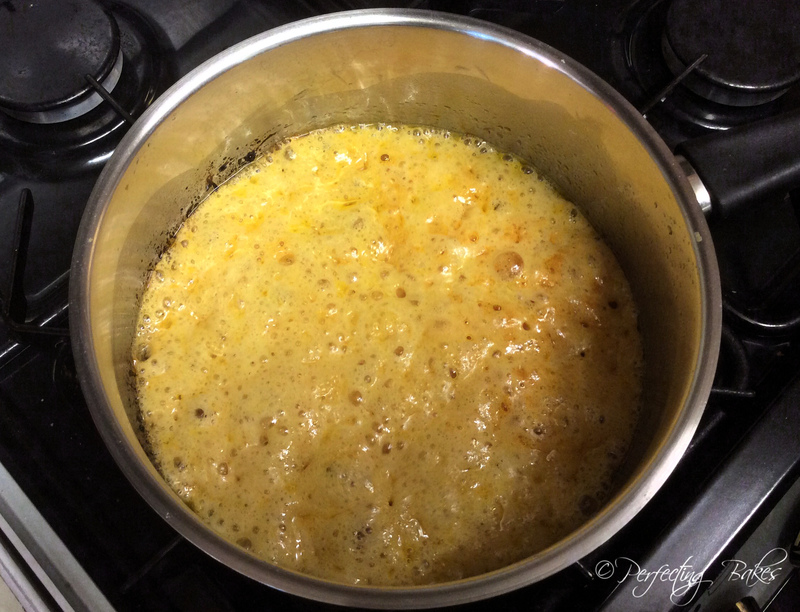 Keep boiling until the mixture goes a beautiful golden-brown colour – this should take about 5 minutes. Butter, sugar & golden syrup bubbling away in the pan. Bicarbonate of Soda added… and the foaming begins. 3. Add the sieved bicarbonate of soda and stir it for a few seconds, this will make the mixture expand and fizz up (take care, as the mixture will expand a lot). 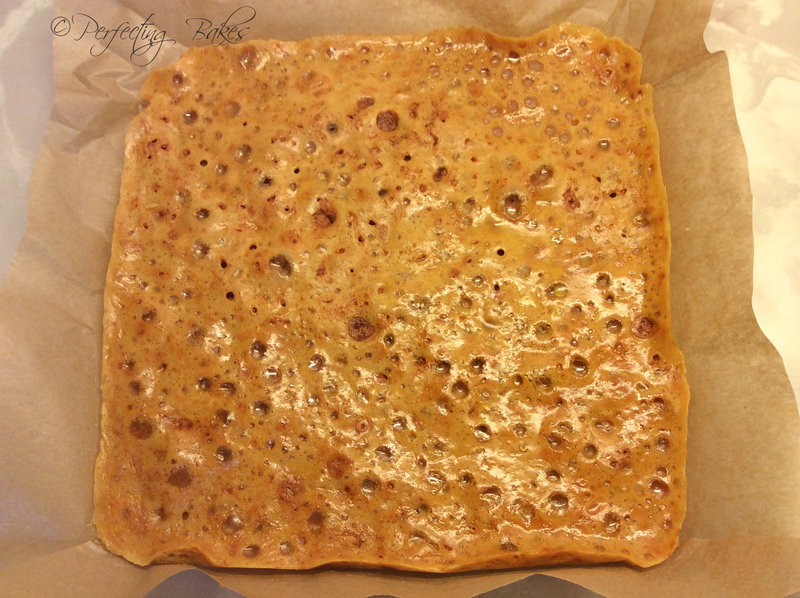 Then as soon as this has happened quickly and carefully tip the honeycomb into your prepared baking tin and leave until cold and set. 4. 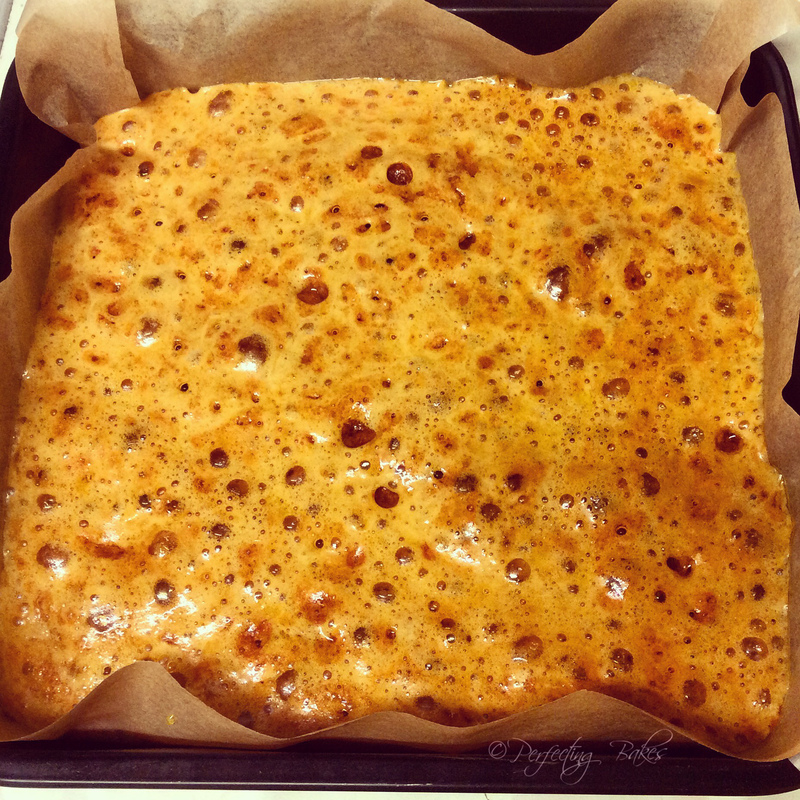 To serve, cut or break the honeycomb up into pieces so you have small shards of this crunchie toffee. You don’t just have to stop there, you can dip or even cover them in chocolate for a more indulgent treat. I didn’t put melted chocolate on mine, so my mom and dad had a square of Dairy Milk and had a piece of the honeycomb at the same time, making their own crunchie. It would make a great gift for someone, especially for a small Homemade Christmas Gift. You can present them in a small cellophane bag with a decorative ribbon or if you have a small box that would be great too just line it with some greaseproof paper. You don’t just have to eat the toffee on its own you can use it to add into or top ice creams or to decorate puddings or cupcakes. 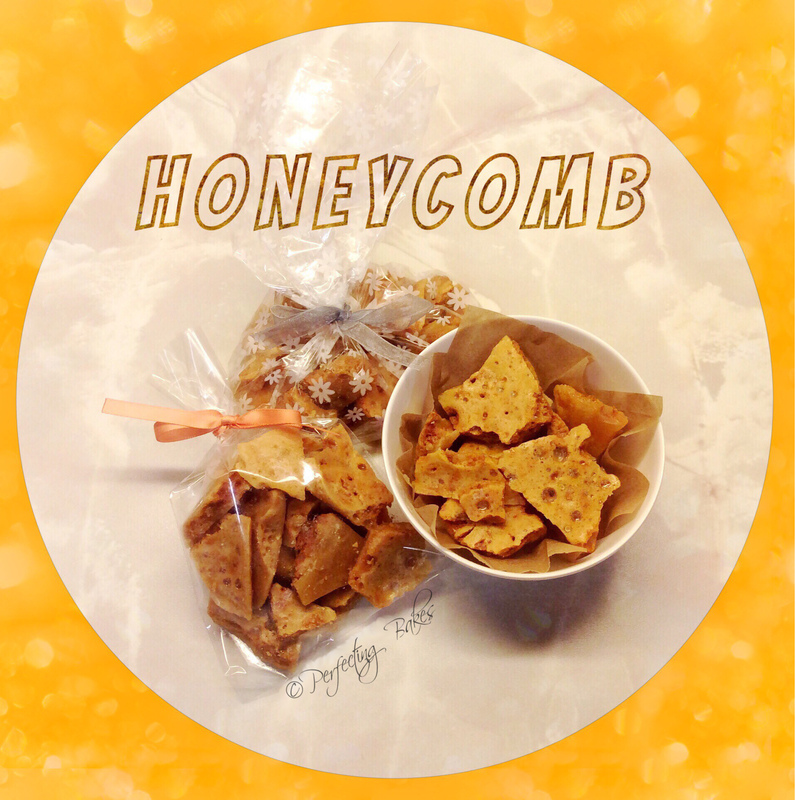 You can put the honeycomb in a food processor and sprinkle it over desserts the choice is yours, get inventive and enjoy!